Reducing climate risks positively impacts our state’s Water, Energy, Air, Land, Transportation, and Health. The Kansas WEALTH project brings together partners working on a range of areas related to health equity issues in order to collaboratively identify opportunities to reduce risk and increase resiliency in the face of a changing climate. In 2016, the Climate + Energy Project (CEP) was designated by the Kansas Health Foundation as one of ten organizations to participate in a cohort that would improve the network of stakeholders working to address health equity in Kansas. CEP formed a partnership with Kansas environmental organizations to explore health inequities caused by a changing climate. The project is called WEALTH; an acronym that stands for water, energy, air, land, transportation, and health. The WEALTH partner organizations include the Kansas Rural Center, Kansas Interfaith Action, Kansas Natural Resources Council, Kansas City Chapter NAACP, and Grassland Heritage Foundation. Read about the WEALTH partners below. While the partners will be exploring the impact on the Kansas community as a whole, the primary focus will be the impact of a changing climate on economically disadvantaged communities, communities of color, and the elderly. Stay up-to-date on our project by checking back here often and by signing up to be on CEP's mailing list! Want to know more? 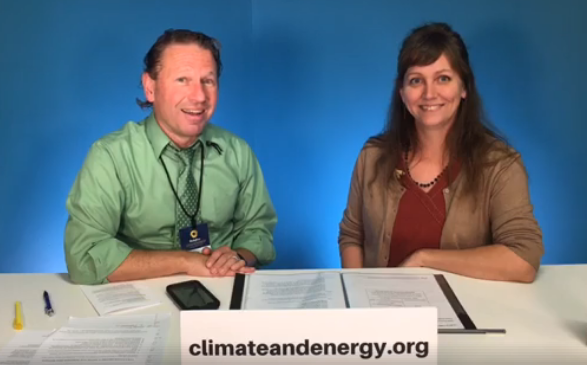 Contact CEP Assistant Director Rachel Myslivy at myslivy at climate and energy dot org. Join concerned Kansans to learn about and advocate for Water, Energy, Air, Land, Transportation, and Health (WEALTH) policies at the Kansas Statehouse! Kansas WEALTH Day brings together organizations, advocates, and legislators to connect on environmental issues. WEALTH Day built upon CEP’s long-standing practice of connecting Kansans to their legislators around energy issues. CEP and partners have co-hosted several energy and environment advocacy days in the last decade. In 2016, the Kansas Health Foundation convened ten Kansas organizations to improve the network of stakeholders working to address health equity across Kansas. The Climate + Energy Project (CEP) is thrilled to be one of the ten Kansas organizations to receive a health equity grant from the Kansas Health Foundation (KHF)! Through the health equity project, KHF seeks to improve the network of stakeholders working to address health equity across Kansas. The grant provides resources that will help grow the capacity of the organizations both individually and collectively so they can better integrate health equity into their work. In order to carry out this work collaboratively all of the grant recipients, including CEP, joined of a statewide Health Equity Cohort created by the Kansas Health Foundation. Kansas Appleseed Center for Law and Justice, to provide cross-systems advocacy for children who are in the juvenile justice system, the child welfare system, or both systems in Kansas. 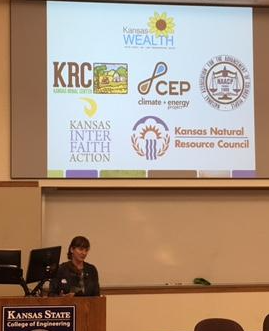 Combining the eco-systemic, public health, stewardship, and energy agendas of these partnering organizations will enable the Kansas WEALTH project to speak to a diverse community of Kansans and explore a range of issues caused by a changing climate as well as their effects on human equity in Kansas. Natalie Fullerton is the Program Director of the Kansas Rural Center’s Community Food Solutions Initiative. This initiative aims to increase healthy foods access and consumption in Kansas, recognizing that in Kansas, our own farms are a critical part of the solution. Though this initiative Fullerton is helping empower Kansans to take the lead in advancing new and identified public policy and actions that better incorporate the state’s farms and ranches into the supply chain thereby improving Kansas’s economy community, environment, and health status. Natalie has a master’s of science in Public Horticulture Administration and a bachelor’s degree in horticulture, both from the University of Nebraska-Lincoln. Rabbi Moti Rieber has served as Executive Director of Kansas Interfaith Action and its predecessor organization, Kansas Interfaith Power & Light, since March 2011. A native of New Jersey, he has lived in Kansas since 2007. He is a graduate of the Reconstructionist Rabbinical College in Wyncote, Pennsylvania. A life-long activist on peace, social justice, and environmental issues, Reb Moti brings a variety of pulpit, interfaith, and organizational experience to the work of Kansas Interfaith Action. Reb Moti and his wife, Suzy, live with their three teenage children in Overland Park. Richard Mabion was born and raised in Kansas City, Kansas. He served a 2-year tour of duty for the United States Army during the Vietnam Conflict (66-68). He graduated from college in 1971 with a BS in Education and a minor in Psychology, and spent the next three decades as a self-taught urban social engineer and businessman in Kansas City and St. Louis, Missouri. Since 2006 he has worked as an independent community organizer in the environmental movement in Kansas City, Kansas. In 2012 he became Kansas Sierra Club’s first statewide Black Board member. In 2014, after running on the environmental literacy ticket, The Kansas City, Kansas NAACP chapter elected him as their president. Larry E. Erickson, president of the Kansas Natural Resource Council, was born in Wahoo, Nebraska on October 8, 1938. He lived on a farm near Wahoo, graduated from Wahoo High School, and attended Luther Junior College in Wahoo. He received a B.S.Ch.E. and Ph.D. from Kansas State University while majoring in chemical engineering. He has served on the chemical engineering faculty from 1964 to the present. In 1967-68 he conducted research in biochemical engineering at the University of Pennsylvania. Since 1985 he has provided leadership for hazardous substance research at Kansas State University. He helps to provide leadership for the Consortium for Environmental Stewardship and Sustainability, and the annual Dialog on Sustainability. He is a member of First Lutheran Church in Manhattan and active in Lutherans Restoring Creation. Kim Bellemere is the Membership and Education Coordinator for the Grassland Heritage Foundation (GHF) where she directs education activities related to tallgrass prairie preservation in Northeast Kansas. She is also a co-chair of the Kaw Valley Native Plant Coalition and is a co-founder and former co-chair of the Kansas Women’s Environmental Network. Kim came to GHF after a career in community health education and non-profit management. Although always concerned about environmental issues, she made the move to environmental education after starting a family and realizing she wanted to do more to protect Kansas’ natural resources. She has also been involved in several community projects in Lawrence, KS including founding an environmental education group and resource exchange for parents, co-founding and chairing the Monarch Waystation program at an area school, and serving on area non-profit boards. A lifelong Kansan, Kim truly understands the crucial role the native environment plays in our cultural and environmental heritage and the importance of preserving it for future generations. Kelly Gilbert's passion for the environment was cultivated early in life on her family’s farm in Kentucky. She has dedicated her career to improving the health of our Earth, and fighting climate change in local communities across in communities across KS and MO. Kelly has been with MEC for over 10 years. She was inducted into the Department of Energy’s Clean Cities Hall of Fame in 2017 and was named an Agent of Change for her leadership in transportation sustainability by the MEC Board in 2010. She serves on the KC Metro Air Quality Forum, KC Metro Climate Action Coalition Steering Committee, and many other climate and energy policy groups across KS and MO. In her free time, she enjoys sustainable veggie gardening, line dancing, and cruising North KC in her electric vehicle. Dawn Buehler is the Kansas Riverkeeper & Executive Director of Friends of the Kaw. In addition to managing the daily activities of FOK, she monitors, responds and mediates suspected pollution incidents to Kansas River; schedules and facilitates our educational paddle trips; and manages our advocacy efforts to protect and preserve the Kansas River. Growing up on a farm on the plains of Kansas, Dawn knew at young age how much she loved the land, water and nature. Dawn was born and raised in the Kaw River Valley in DeSoto on a 2,000 acre crop farm. The family farm ran along the Kansas River in DeSoto. She spent her childhood riding alongside her father learning about the importance of taking care of the soil, water and providing for the family. She also spent many hours on the beautiful Kansas River fishing, camping, canoeing and riding in her Dad’s airboat. Her love for the river began at this early age when she would sit and watch the sunset on the river at the end of each farm day. Dawn continued to help on the farm and also went on to college after high school and earned both a Bachelor of Science in Natural Resources, Fish and Wildlife Conservation from Oregon State University and a Bachelor in Business Administration from Baker University. Dawn has spent her career working as a conservationist, accountant and farmer. Dawn’s passion is watershed management and finding ways we can all work together to improve our watershed and the quality of the Kansas River. As a Kansas native, Dawn has a vested interest and passion for the river. Dawn is happiest when she is outdoors. You can often find her fishing, hiking, kayaking, reading and exploring. Dawn lives with her family, including two chocolate labrador retrievers, on their farm south of Eudora. The American Public Health Association (APHA) named 2017 The Year of Climate Change and Health. All year long they're hosting webinars, workshops, and sharing handouts and articles about climate change and health. Each month they have a theme connecting climate change and health. The Climate + Energy Project joined APHA's program as a Gold Change Champion, with the commitment to increase public awareness on climate change and health. CEP has also embarked on a series featuring our cohort partners in the Kansas Health Foundation Health Equity Partnership Initiative, we are drawing connections between climate change and health equity concerns. Check out the videos below by clicking on the image. 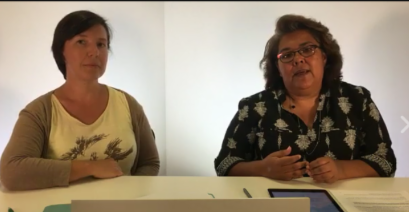 Elina Alterman from Kansas Health Foundation and Rachel Myslivy discussed the connection between health equity and climate change. Extreme weather and climate disasters can result in stress, anxiety and depression. Andy Martin from NAMI Kansas (National Alliance on Mental Illness) and Rachel Myslivy discussed connections between mental health and climate change and services available at NAMI. 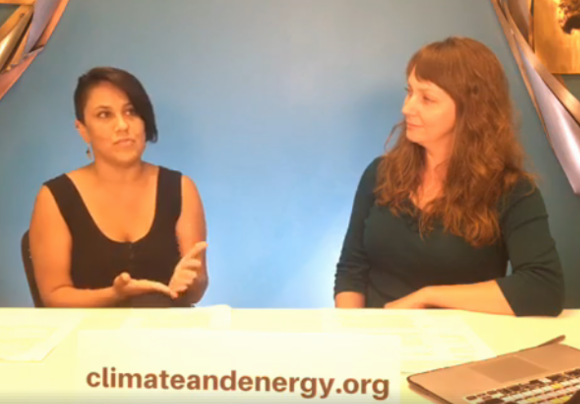 Irene Caudillo, President of El Centro and Jamie Hofling highlighted connections between Latino communities and climate change, including ways Latino communities are working towards climate resilience. Irene explained the importance of collaboration with Latino and Spanish-speaking populations here in Kansas and the need to find common ground in our communities. At the 12th Annual Dialog on Sustainability speakers shared information on a range of issues connected to climate change and health. CEP's presented on the WEALTH Project. As part of the Dialog on Sustainability, a Resource Guide was created by Kansas State University librarians. It lists articles and research related to climate change and health.